・Display the number of pin in pin icon directly. ・Make the content of the title field in the file information screen or the pin information screen to display fully. ・Make it that the order of the attached files of a pin could be modified. ・Make a file to add in MyDocs then to display when it is imported to Field Pad. 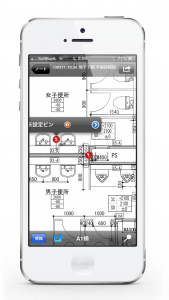 ・Show a logo screen behind when inputting passcode to make the screen inside cannot be shown. ・Support the two-step verification and new API during the login of Dropbox.